The word kimono (着物) was historically used as a general term to describe clothing, as it literally translates as “something to wear.” Today, the term specifically refers to the long garments that have become popularly recognized throughout the world as a symbol of Japanese traditional clothing. Over Japan’s history, the kimono has come to exhibit different designs, colors, and materials, with each variation adopting a specific meaning. This immense variety in kimono styles can still be seen today, serving as a testament to the rich accumulation of cultural heritage that is preserved in the everyday lives of the Japanese people. Kimono are probably best known to be made out of silk, which is collected from silkworm cocoons. Silk is a highly coveted material, and kimono made out of silk will fetch a very high price that can vary depending on the style and method of production. It can require up to 2,700 cocoons of silk to make one roll of high quality silk fabric. Nowadays, kimono can be found made out of various different materials: silk, cotton, wool, linen, and polyester. Studying the sewing pattern of a kimono, you will probably notice that it is quite simple in composition. It consists of a body, two sleeves, and a collar. There is generally a one-size standard for most kimono, using a roll of kimono fabric that is approximately 36cm by 12m long. Kimono for men and women will vary slightly in design. Men's kimono exhibit the shortest sleeves of all kimono, while women's kimono will have sleeves longer than the men's, and sometimes very long sleeves known as furisode (振袖), which are reserved for young unmarried women for formal occasions. Kimono are wrapped around the body and tied using a belt called an obi (帯). Obi for men are much thinner than obi for women and are tied much closer to the hips. Each material has its respective merits and qualities, and their properties sometimes dictate which season and for what occasion they are appropriate. For example, a kimono made out of cotton known as yukata (浴衣) as well as those made of linen are typically only worn during the hot summer months. There is also a special type of silk kimono known as ro (絽) which is very thin and has a sheer quality—a perfect way to stay cool during the humid summers. Kimono that are double lined are known as awase (袷), and they are worn during the colder months (typically from October to May). Hitoe (単衣), or single layer kimono, are worn during the short time frame when it’s too warm to wear awase, yet not warm enough to wear yukata, linen, or ro kimono. As you can probably guess, kimono have not always looked the way they appear today, and the variety of colors and designs have changed over the centuries. It can be said that the usage of colors can generally be divided into two main categories: colors used from the Asuka period (592-710) to the Muromachi period (1336-1392), and more modern colors that primarily made their appearance during the Edo period (1603-1868). Dyes were created using natural bases including safflower, the rouge color from the carapace of the kaigaramushi (type of insect), and even persimmon juice. Browns and pinks of different shades were popularly used. During the Edo period, the shogunate banned the public from showing luxury and excess in their lifestyles through a prohibition law. Subsequently, flashy colors were banned from fashion. The latter half of the Edo period, however, was a time of financial abundance, and just like many people today, people of Edo wanted to wear colors that reflected this. They found a way around this ban, mixing bright colors with shades of grays and browns. A plethora of new colors appeared during this time, including subdued pinks and browns, oranges, greens, and purples. There is even a term created, shijū haccha hyaku nezu (四十八茶百鼠), or literally "48 browns and 100 grays," that exemplifies the diversity in colors that were born from shades of brown and gray. Some estimate that there are over 400 colors that are named, and today they are considered Japanese traditional colors. Kimono and obi can be roughly categorized into two main groups based on the way they are made: some (染め) and ori (織り). The two are differentiated by the order in which the threads are dyed. The some process refers to the weaving of white thread to make a plain fabric that is dyed afterwards. Ori refers to the process of dying the threads before they are woven together. Kimono made with the some technique tend to be more formal, while kimono made with the ori technique tend to be more casual. The opposite goes for the obi; obi made with the ori technique are considered more formal, and obi made with the some technique are considered to be more casual. Thus, when assembling an outfit, an ori kimono will typically go with a some obi, and a some kimono with an ori obi. Kimono can vary from muji (無地), meaning plain with no extra designs, to variations with intricately ornamented patterns. Different styles and patterns developed over time. One of these styles is called shima (縞). Shima can be identified by vertical stripes that run along the entire length of the kimono. Although the pattern is often mistaken as a traditional Japanese design, it actually originated outside of Japan. This is where its name comes from—shima, which means island in Japanese. The term was used to describe the striped pattern that arrived from Southeast Asian “islands.” Shima became a popular kimono pattern in the Edo period after Kabuki actors and oiran (high-class courtesans, precursor to geisha) began wearing kimono with the striped shima patterns. The different striped patterns were given names, with bōjima (棒縞) being one of the first recognized shima patterns. 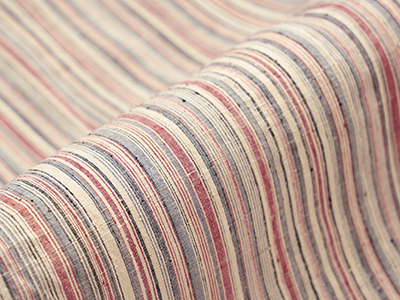 It consists of a two-toned striped pattern with the stripes being the same thickness throughout. It is said that this was probably one of the main patterns that arrived from Southeast Asia, and it was a typical pattern worn by craftsmen during the Edo period. Yatarajima (矢鱈縞) is another shima pattern that came about during the Edo period, and it consists of around 8 different colored stripes of varying thicknesses (hence its name, yatara, meaning reckless or at random). It is a bright design that was worn by women as well as “fashion-forward” stylish men during the Edo period. Some (pronounced soh-meh) kimono are said to be able to express soft lines and contours that ori kimono are unable to create. Within the category of some kimono, there are various styles that are characterized by factors such as production method, motifs, and composition. Many of these varieties have ties to specific regions or cities. One style is known as kyōyūzen (京友禅), originating from Kyoto. It is said that during the Edo period, a very popular folding fan artist named Yūzensai Miyazaki, who lived in Kyoto, was asked to decorate a kimono with one of his designs. This is said to be the beginning of kyōyūzen, and people say that his design was so popular that it became a style of some kimono. Kyōyūzen is characterized by its utilization of traditional motifs and geometric patterns. From far away, the pattern should appear to be one large picture, with the image concentrated in the center and fading out towards the edges. It can be decorated with tie-dye, known as shibori (絞り); embroidery, known as shishu (刺繍); and silver or gold foil leaf, known respectively as ginpaku (銀箔) and kinpaku(金箔). Another style of some kimono, which was also named after Yūzensai Miyazaki, is kagayūzen (加賀友禅). During the Muromachi period, the some style of kimono was heavily produced in the Kaga area of Ishikawa Prefecture. It was during the middle of the Edo period that Yūzen, while living under the roof of a some artisan, experimented by adding his own design to an existing some kimono-resulting in the beginning of kagayūzen. It is a style that is known for depicting the natural beauty of the Hokuriku region (Niigata, Toyama, Ishikawa, and Fukui Prefectures). One unique detail is that foliage will often exhibit black dots or discoloration, serving to give the appearance that bugs have eaten part of the leaf. Unlike kyōyūzen, techniques such as shibori, shishu, ginpaku and kinpaku are not used very often, and the design is usually concentrated towards the outside, not the central area. Another design that is popularly seen on kimono is the mon (紋), or ka-mon (家紋). This insignia appeared during the Heian period as a way to distinguish families from one another just by their attire. The mon was used during the feudal society of the samurai as a way to indicate the war successes of generals. Today, mon can be seen imprinted on formal kimono typically in five locations—four on the sleeves and one at the base of the neck. The presence of the mon indicates a kimono to be worn for formal occasions (such as weddings) and not for everyday use. Visiting Japan today you will notice that Western clothing is the norm. However, the practice of wearing kimono remains an important part of Japanese culture, and it is not uncommon to catch glimpses of people wearing kimono in public. It is common for people to wear kimono at events such as weddings, funerals, coming-of-age ceremonies, graduation ceremonies, and when viewing or participating in performances or events dealing with the traditional Japanese arts. For practitioners of the Japanese traditional arts—Japanese tea ceremony, classical dance, and music—learning to properly wear a kimono is often a part of learning the art form itself. Outside of these traditional arts, most Japanese do not wear a kimono regularly and more often than not, they do not know the proper way to put on a kimono and tie an obi. Thus, there are kimono "teachers" who professionally dress people as well as teach people about the various rules and customs surrounding kimono. Even though the kimono doesn't find itself a part of the everyday lives of most Japanese people, it is loved by everyone. With a multitude of kimono and obi designs and patterns to choose from, the possibilities are endless. Also, wearing a kimono doesn't just change the way you look, but also the way you move. Movements might seem a bit more restricted, but in a different light they might be interpreted as more elegant, purposeful, and poised. This introduction to kimono has hopefully provided a glimpse into the vast world of the Japanese traditional attire that is loved by so many, both in Japan and abroad.